Hi Sarah, about a year ago, I started getting dark pigmentation spots on my bottom lip only and I feel like it has gotten worse. Is this only a medical issue or a cosmetic issue or both? Should I see a doctor? How can I remove the pigmentation? Just to add, I don't smoke or drink alcohol/coffee and I am generally pretty healthy. However I do have dry skin and my lips are always dry/cracked but I always put chapstick on and never pick at them. I actually think that the pigmentation looks good because it nicely and precisely frames the lips. Like a lip liner that looks totally natural.. Most pigmentations are a result of sun exposure and lips that are dry and cracked are especially vulnerable to UV damage. You must start using a sunscreen on your lips every day. Every second day when you brush your teeth in the evening, use your toothbrush to massage/exfoliate the lips. Do it very gently, especialy in the beginning. Try it first on your upper lip to see how the lip reacts. Always keep the lips soft, for example with Vaseline. The greasier the better. Apply the sunscreen first. Concerning the pigmentation, you can try a cream that contains hydroquinone but you will risk the pigmentation will get uneven (some parts will get lighter and some will not). 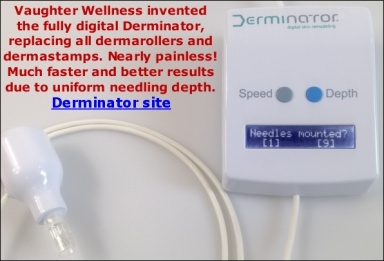 Dermarolling is not appropriate in this case. Thank you for your reply Sarah. I only want to lighten the dark pigmentation spots on my BOTTOM lip (I am not sure if you can see them in the image but they are brown dark spots near the center of my bottom lip). I like overall color of my lips (and that "natural lip liner") but I dislike the dark spots on my bottom lip. I read about lightening the dark spots with lemon juice or hydroquinone (I have 4% hq) but I am worried it will irritate my lips. Do you think I should try either method ONLY on my bottom lip dark spots? I see what you mean. The same is valid for those spots. Sun protection and preventing dryness. Try hydroquinone or freshly squeezed lemon juice. Hello Sarah, I have posted previous photos of my lips several months ago where you can see dark spots on my BOTTOM lip. They were bothering me so I decided to remove them using apple cidar vinegar (I could not get a hold of hydroquinone). I placed acv on a ear swab and held it there for about 10 min for 3 times a week and I did this for 2 months. The dark spots peeled off but they were bleeding and it was painful. However, I made sure I was moisturzing my lips a lot. In the new pictures below, the dark spots are gone, but I really dislike how the middle part of my TOP lip peels constantly and from the images below, you can see that the skin is peeled and is red/raw. I do not pick the skin on my lips and I ALWAYS moisturize and exfoliate my lips well so I don't know why this is happening. I have had this condition for about 1 year now. I am not sure if it is fungus on my lips but it does not seem normal. Should I see a doctor? The skin on the lips is very thin skin and they have no sebaceous (oil producing) glands which makes them extremely prone to drying out. The part of the lips that gets frequently wetted by saliva is actually even more prone to drying out. You should always keep an oily film on the lips to prevent evaporation. Vaseline is very efficient for this. I do not think you have a fungal infection; it seems that the area is "raw" and it has never healed. You can try to treat the area with Betadine ointment (a topical antiseptic containing povidone-iodine) just in case there is a microbial infection.